When out golfing one afternoon, young Mr Bobby Derwent finds a handsome stranger at the bottom of a cliff, near death. While his golfing companion goes to get help, Bobby sits with the stranger, who soon expires, but not before uttering: “Why didn’t they ask Evans?” While looking for signs of identification, Bobby finds the photograph of a very beautiful woman in the dead man’s pockets, but nothing else to give him a sign of the man’s identity. The local inquest rules the man’s death a tragic accident. Yet Bobby can’t entirely shake the feeling that there’s something else afoot. Strangely, shortly after the inquest, the slightly aimless young vicar’s son is offered a lucrative job in a law firm in South America, but feels he must decline. The next thing he knows, he wakes up in hospital, having been the victim of an attempted poisoning while eating a picnic lunch. It’s almost miraculous that he survived. By this point, both Bobby and his childhood friend Lady Frances “Frankie” Derwent are convinced that the stranger was murdered. They decide to team up to discover why the stranger was murdered and what the significance of his last words were. 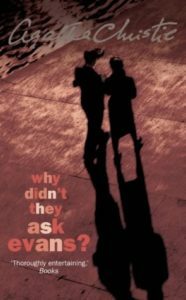 Filed Under: Fiction, History, Mystery, Romance Tagged With: 1930s, agatha christie, audio book, cbr11, historical fiction, Malin, mystery, romantic, Why Didn't They Ask Evans? Share the post "Revisiting a favourite from my early teens"